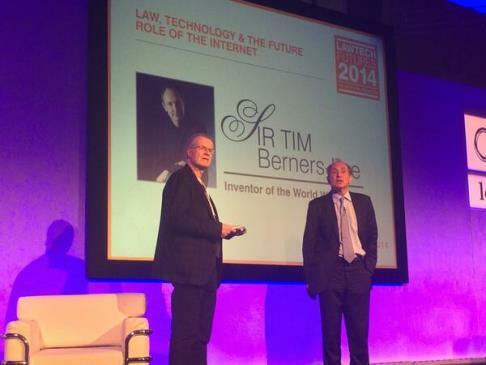 Yesterday was LawTech Futures 2014 – The Future of Legal Technology (Europe’s largest legal technology event). The last two years I was invited to attend, went and wrote reviews: LawTech Futures 2012 Reviewed: The Search for the Holy Grail of Legal Technology Conferences has Begun! and LawTech Futures 2013 Reviewed: The one with the neocortex. This year I must have fallen off the invite list. So no review I am afraid but just a few comments generated via Twitter from this side of Hadrian’s Wall. Legal Conferences (especially Futuristic / Technology ones) are usually well covered these days on Twitter. Indeed sometimes you can glean as much about the Conference from Twitter as actually being there e.g. LawTech Camp London 2012: In Tweets. @planty was there perhaps less to tweet about? Sir Tim seemed to be the main topic of tweets – but not much there I could see for legal? Nick Holmes on 26/03/2014 at 10:13 am. Could it be that (legal) technology is not very interesting to most of us? It’s what you do with it that matters. Brian Inkster on 26/03/2014 at 7:01 pm. Probably very true. But it should be of interest to those attending Legal IT Conferences and therefore you would think they would perhaps tweet about it. Maybe if they were being told what to do with it they would tweet about that. Is this therefore what is lacking at Legal IT Conferences? Moran Ryan on 03/04/2014 at 6:18 pm. Unfortunately we didn’t make it but I would hazard a guess that the speakers – including Mr Web himself did not do a good job of prompting the usage of Twitter with the use of hashtags etc on their introductory and final presentation slides? Looking at the picture at the top of the post I can’t see any social media information – no @ # or anything?